Well, that's graduation over and done with. Was pretty tedious in places, but overall I'm glad I did it. It draws a line under things, so to speak. 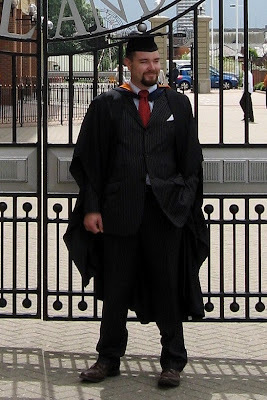 For anyone who's interested, have a pic of me in my academic finest. I also started my new job today. Pretty promising so far. Did a couple of client visits today - simple stuff, but all part of the job, built a server, set up my work machine, etc. and tomorrow I'm off to visit the company data centre. I'm pleased that everything is turning out as expected thus far. Definitely a week to remember. Providing a blinding example of how much attention I've been paying, I've just found out that Google have ceased development of their excellent Notebook service back in January. Seems a shame as I find it an excellent tool. The reason I haven't noticed is because Google are still providing the service to those who were already using it, but not letting new users sign up. Seems a bit odd to me. Why have it there and not let everyone use it? They are recommending the use of Google Docs as an alternative, but for me it just doesn't have the same functionality. If like me you use a domain name provider that doesn't let you use CNAMEs for your DNS server entries, and you use Google services (such as Blogger) with your private domain name you may have noticed a problem with accessing your page/service/whatever in the last few days. This seems to be because the IP address of ghs.google.com that was floating around on various forums (72.14.207.121) no longer works. Yes, I know Google specifically says not to use the IP address for exactly this reason, but unfortunately I don't have a choice. A Records only with my domain supplier. For anyone having the same issue, change your DNS forwarding IP for ghs.google.com to 74.125.77.121 and give the DNS changes time to propagate. That should be problem solved. I found this solution by simply pinging ghs.google.com and using the returned IP, which seems to work. Good luck. Got me a decent sounding job at last. Officially titled ICT Support Technician, it'll be working with a local IT service provider doing things like network and server installation for small (or less small) companies, supporting them once the systems are in place, etc., performing backup services, loads of stuff - basically doing the work for those without the specialist in-house knowledge, or who are too small to warrant their own IT team. Sounds like exactly the sort of thing I want to be doing to start putting some practical experience and applying the stuff I've been learning. Can 't wait. I start next week, and also have my graduation. Should a good week. I'm hoping that getting some hands on work in the networking field will also gove me a more original base of material to write about. Fingers crossed and all that jazz. Got notification through today that I've passed my honours degree. Now I can put letters after my name and everything. The foolish hat wearing ceremony (or graduation,) is in two weeks time. On with the job hunt... Someone give me something interesting to do!